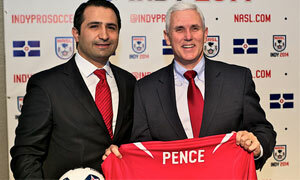 Ersal Ozdemir, a Turkish businessman from Indiana state, will start a soccer team in Indianapolis, capital of the state. The team will be the first professional soccer team of Indianapolis and compete in North America Soccer League-NASL, second division of the US. Ozdemir (38), Keystone Group President and a prominent local developer, announced his plans at a press conference. Indiana Governor Mike Pence and Indianapolis Deputy Mayor Deron Kintner attended the event. Locals paid great attention to the event. Speaking to AA correspondent, Ozdemir said soccer in US was not at the level of European soccer but very popular among youngsters. He said he would do his best to make the team a big club over the years. He has hired Peter Wilt, the former founding general manager of the Major League Soccer's Chicago Fire, to lead the initiative and is looking for investors to defray start-up and operational costs. He said they plan to start training in November. Ozdemir is asking local residents via the website indyprosoccer.com to suggest colors and a name for the fledgling franchise. The contest to name the team will run through mid-March, and the team's name will be announced during the third week of March. He said they would like to invite a European or even a Turkish club for a friendship game and they were open to transfer Turkish soccer players.